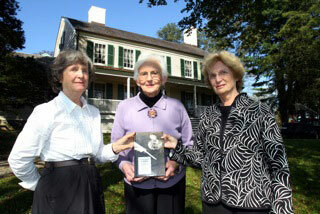 In the Words of Women is the work of independent historians Louise V. North, Janet M. Wedge and Landa M. Freeman (pictured left-to-right in the adjacent photo*), who tracked down, selected, and often transcribed material from original manuscripts. We three also wrote the book’s introductory material, scene-setting descriptions for each chapter, as well as its short biographies and explanatory notes. This book is our second collaboration. Our first was Selected Letters of John Jay and Sarah Livingston Jay, published by McFarland & Company in 2005. In our first collaboration we’d come to love the “voice” that’s unique to original documents and to relish the detective work of tracking down primary sources. But after focusing mainly on one woman, we decided to cast a wider net: more women (144) and a longer span of time (34 years). The result, we hope, is a tapestry of authentic voices, offering insight into the interplay of daily life, political upheaval and military conflict during the Revolutionary Era. Louise V. North was educated in New York City where her father was Queen Wilhelmina Professor at Columbia University. She received a B.A. from Barnard College and an M.A. in Art History from Columbia. An independent scholar, she presented a paper titled “The ‘Amiable’ Children of John and Sarah Livingston Jay” at the New-York Historical Society in December 2004. Her article “Sarah Jay’s Invitations to Dinner/Supper, 1787-1788” appeared in The Hudson River Valley Review, Vol. 21, No. 2, Spring 2005. Janet Wedge, also a graduate of Barnard College, earned an M.A. at Teachers College, Columbia University, and another in Political Science from The New School, in New York City. She taught high-school American Studies for 23 years and for several years was an adjunct professor at Manhattanville College where she taught a required course on research and writing. She has extensive writing and editorial experience. “Detach’d from Earth,” an article she authored about the first flight of the Montgolfier balloon in Paris in 1783, observed by Sarah Jay and described in letters to her husband, appeared in the Summer 2005 issue of The Westchester Historian magazine. Landa Freeman is a graduate of Mount Holyoke College, where she was a Frances Perkins Scholar. In connection with the Jay book, Ms. Freeman developed a lecture with slides titled “Sarah Livingston Jay, the Extraordinary Wife of John Jay,” which she delivered at the New York State History Conference in June 2002 and has since presented to numerous historical societies and university groups. She is the author of “Mr. Jay Rides Circuit” published in the Journal of Supreme Court History, March 2006, Vol. 31, No. 1, based on Jay’s letters to his family while he was away on court business.